Due to its multiscale and multi-layer natures, the coherent structures of turbulent in the open channel flow is complex and difficult to be visualized for understanding its evolution. In this paper, five types of methods for the vortical structure in the fluids, namely the Q - criterion, the vorticity, the Omega method, the velocity-vorticity correlation structures (VVCS) as well as the most recent Rortex method, are adopted to visualize the turbulent flow in the open channel. With the free surface modelled as a free slip boundary, a direct numerical simulation (DNS) is carried out to study the multi-layered flow structure characteristics under the free surface. The visualization results by the Q - criterion, the vorticity, the Omega method and the Rortex are firstly analyzed. Then the turbulent flow layers near the free surface are identified with corresponding anisotropy indices. Afterwards, the VVCS within various turbulence layers are visualized accordingly. 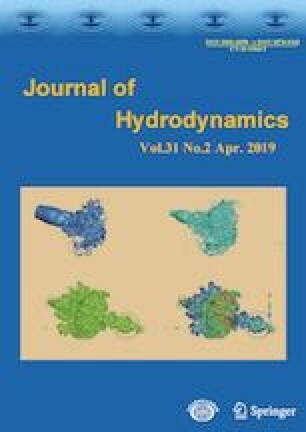 This research indicates that the VVCS can straightforwardly show the geometry information of the coherent structures of turbulent in different layers for the open channel flow. Project supported by the National Natural Science Foundation of China (Grant Nos. 51809084, 91852117). Biography: Xiao-dong Bai (1986-), Male, Ph. D.
This work was supported by the Fundamental Research Funds for the Central Universities (Grant No. 2013/2018B56314).